Josiah was only eight years old when he became king of Judah. His father had been a wicked king, but Josiah chose to be righteous. When he had been king for several years, he ordered that the temple be repaired. While that was being done, the “book of the law” (scriptures) was found. The high priest sent it to King Josiah, who studied it carefully. To his dismay, he discovered that he and his people had not been living the gospel. He wept when he realized that they had been worshiping idols (false gods). He ordered that the idols be destroyed. The Lord saw that Josiah wished to be obedient and live according to the scriptures, and promised him that though Jerusalem would one day be destroyed because of its wickedness, it would not happen while he was king. King Josiah had all the people brought before the temple. As he stood next to a pillar, he read to them from the book of law. He then had them make a sacred covenant to “walk after the Lord, and to keep his commandments … with all their heart and all their soul, to perform the words of this covenant that were written in this book” (2 Kgs. 23:3). All the people agreed. Josiah tried all his life to live by the scriptures, and he tried to teach his people to do the same. Though his people did not remain faithful after his death, Josiah was such a righteous man that it was said, “like unto him was there no king before him, that turned to the Lord with all his heart, and with all his soul, and with all his might, according to all the law of Moses; neither after him arose there any like him” (2 Kgs. 23:25). Instructions: Color the flannel board figures, then mount them on heavy paper. Cut them out and use them to retell the story of righteous King Josiah. 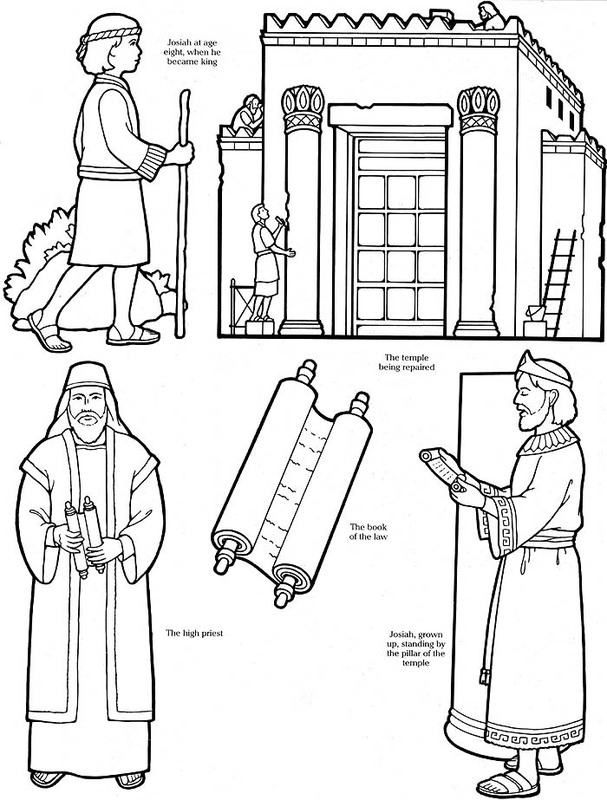 Josiah at age eight, when he became king; The temple being repaired; The book of the law; The high priest; Josiah, grown up, standing by the pillar of the temple.